The history of the Hawker Sea Fury in service with Iraq from 1947.
he first modern fighters in service with the Iraqi Air Force was Hawker Fury. In May 1948 the first eight Fury F.Mk.1s, (serialled 231 thru 237, and 239), as well as a single two-seater (161) were delivered to the No.7 Sqn. This unit was at the time flying Anson bombers, but most of these were either sent to Mafraq AB, in Transjordan, from where they participated in the I Arab-Israeli War. Therefore, a number of former Anson-pilots were swiftly converted to the Fury at the Muascar ('Airfield') al-Rashid AB. The No.7 Sqn was at the time commanded by Lt. Col. Muhammed Rauf Hassan. 221, depicted here, was the first Fury delivered to Iraq. It was seen for the last time while departing Hawker's Langley airfield for Iraq, in May 1948. Initially, Iraqi Furies suffered considerable attrition, as their pilots were trained in a rush. Already on 7 June one was lost in a crash at Muascar al-Rashid, killing the pilot, Capt. Yahya Dubuni from the No. 1 Sqn. This unit was at the time actually still based at Mafraq AB, in Transjordan, from where it flew combat missions against Israel, but some of its pilots - including the CO, Lt. Col. Nadim Sadiq al-Ubaidi - were sent back to Iraq to train on Furies, which initially entered service with the No.7 Sqn. Fury F.Mk.1 '240' belonged to the second batch delivered to Iraq. By the time decision was taken to move the reformed No. 7 Sqn to Amman, in Transjordan, from where these were to participate in the war against Israel, only six out of some 14 aircraft delivered were still operational. On 18 July 1948, six RIrAF Fury F.Mk.1s of the newly-reorganized No.7 Sqn (which previously passed all its remaining Ansons to the No.1 Sqn, still deployed in Transjordan) finally arrived at Amman. After a short assessment of the situation there and on the front, a decision was taken to re-deploy them to Damascus al-Mezzeh AB, in Syria, from where they were to fly their first combat sorties. On the following morning, on 19 July 1948, the aircraft flew to Damascus, however, two had accidents on landing, and became inoperational. Nevertheless, on the same day the No.7 Sqn RIrAF was to fly its first and last combat operations over Israel. Around noon, Maj. Talid al-Tikriti lead 1st Lt. Arif Abdul-Razzak into armed reconnaissance over Haifa, where they were to look for eventual ships bringing illegal Jewish immigrants. After finding no targets in the area, the pair returned to Damascus without any incidents. 1st Lt. Abdul-Razzak participated also in the second mission over Israel launched on the late afternoon of the same day, and lead by Maj. Raschid al-Anvar. Maj. al-Anwar lead his pair into armed reconnaissance over Ramat David and Sde Dov, where several Israeli aircraft were detected on the ground. Making a bombing and straffing pass each, the two pilots claimed destruction of one of Israeli Boeing B-17 Flying Fortress bombers. Due to the temporary armistice no additional combat sorties were flown. Instead, the No.7 Sqn was advised to hand its remaining four operational Furies to Egypt, while the crews were returned to Iraq. Not that they could do much even in the case they would remain in Syria, however: when deployed to al-Mazzah, the squadron was given only 2.000 rounds of 30mm ammunition and a dozen of bombs. 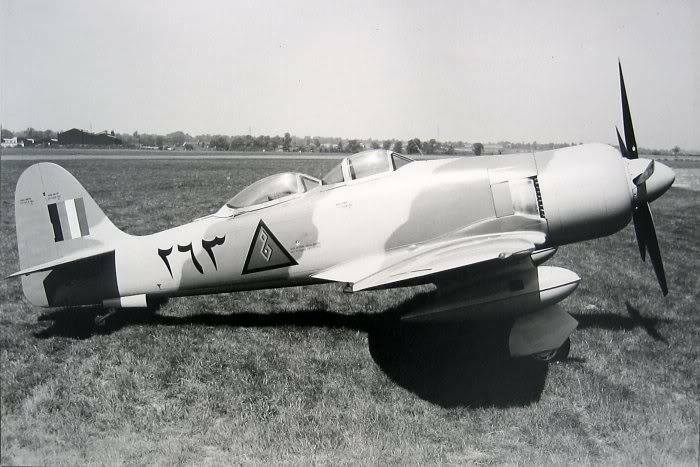 Despite these early problems, the RIrAF was to continue purchasing Furies, and acquired a total of 38 F.Mk.1s, and four two-seaters. Aside from the No.7 Sqn, the No.1 Sqn was later also re-equipped with them. 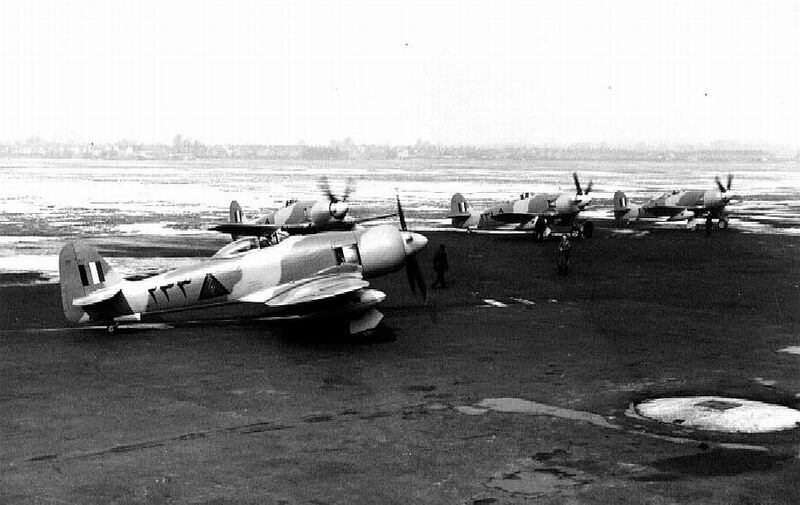 A further fifteen newly built aircraft were ordered on 21 July 1951, and were followed by 10 refurbished FB.11s and three T.20s, ordered on 7 March 1953. The Sea Furies were used to equip Nos.1, 4 and 7 Squadrons in the Iraqi Air Force, and may have been used against the Kurds in Northern Iraq. They were withdrawn in the early 1960s and replaced by the Hawker Hunter.